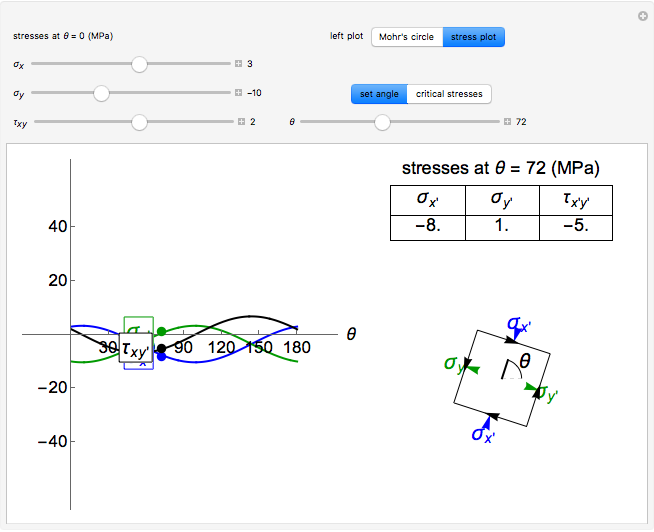 This Demonstration uses a Mohr&CloseCurlyQuote;s circle and a stress plot to show the effects of stress transformation on a differential element or area. Use sliders to vary the stresses , and , which correspond to the stresses on the differential element at (dashed black line). Select "set angle" to vary the angle with a slider. Stress transformation equations are used to compute the transformed stresses , and (solid black line), which are shown on the differential stress element as blue, green and black arrows, respectively. Select the "Mohr's circle" button to display Mohr's circle on the left. An angle of on the differential stress element corresponds to an angle of on the Mohr's circle. 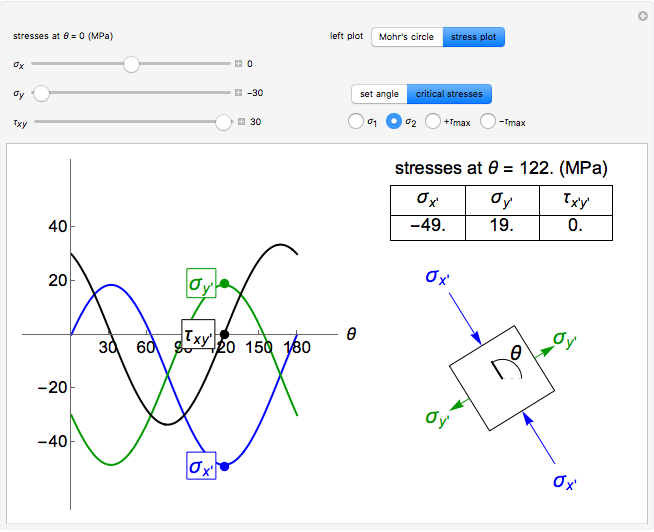 Select the "stress plot" button to display a plot of all three transformed stresses versus on the left. 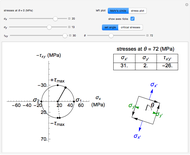 Select "set angle" to set with a slider or "critical stresses" to snap the diagram to the angle of one of the principal stresses ( and ) or one of the maximum in-plane shear stresses ( and ). 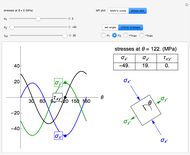 Note that Mohr&CloseCurlyQuote;s circle is displayed with positive in the downward direction, so an increase in results in a counterclockwise rotation on both the Mohr's circle and the differential stress element. where is the average of the and stresses, and are the normal stresses in the and directions and is the shear stress (MPa) at . 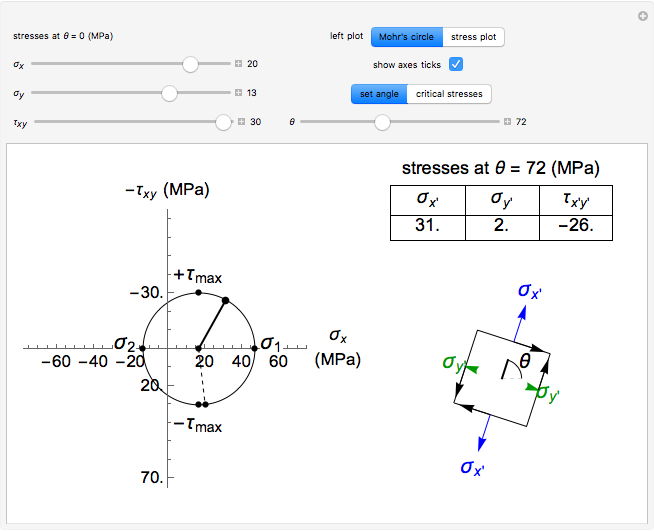 Here is the angle of rotation (positive in the counterclockwise direction), and are the normal stresses in the and directions (MPa) and is the shear stress (MPa). where and are the first and second principal stresses (MPa), and are the first and second principal angles and is the radius of Mohr's circle (MPa). By convention, the right-hand principal stress on the Mohr's circle is denoted as . 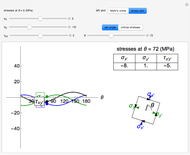 The maximum in-plane shear stress is and the maximum shear angle is . R. C. Hibbeler, Statics and Mechanics of Materials, 4th ed., Upper Saddle River, NJ: Pearson, 2014. Nick Bongiardina "Mohr's Circle and Stress Transformations"